Chartered in 1896, the Hawkinsville & Florida Southern first ran from Hawkinsville to Worth, about three miles from Ashburn. They also operated a 15-mile branch line from Davisville to Fitzgerald. In 1907 the railroad was leased to The Gulf Line Railway and the two lines merged in 1909, retaining their names. The H&FS was bankrupt by 1922 and its tracks abandoned in 1923. It was an important presence in Pineview in its heyday. 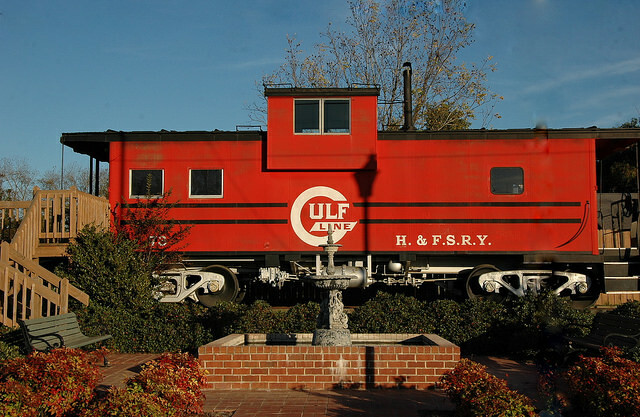 Due to the fact that the railroads retained their own names (Gulf Line and Hawkinsville & Florida Southern) this caboose is a commemoration and not an actual relic. 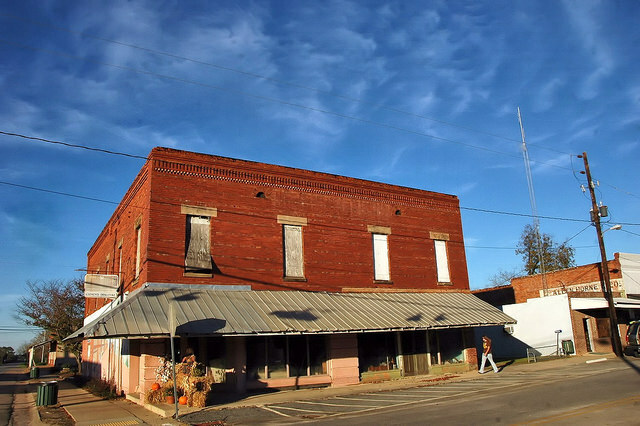 When I first posted this image of “Doc” Clements’ drugstore nearly four years ago, the building was in bad shape, as evidenced by the boarded-up second-floor windows. 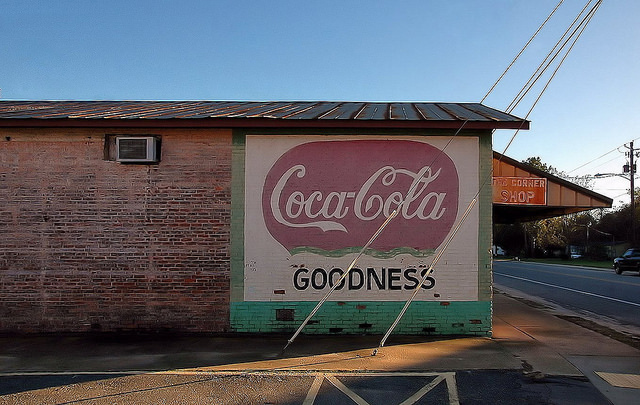 But I see lots of places like this in small towns all over South Georgia, and I didn’t think much else of it until Betty Thomas sent me a message that it was being demolished. 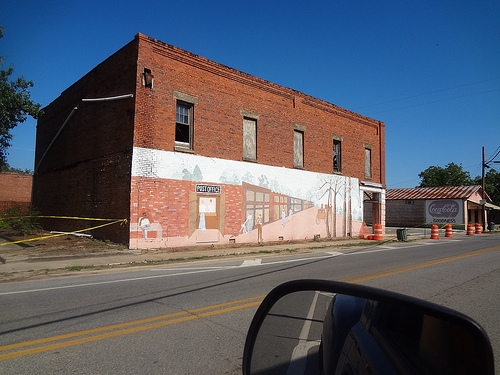 On 31 May 2013, she wrote: As for Doc’s Store, the new owner was holding out for more money, until it was too late! The roof caved in and the front bricks started bulging out. 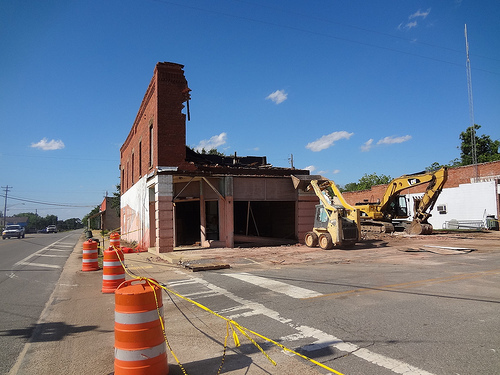 It became a hazard to the town and the main highway GA 112 going through town. Actually before they got it completely torn down, the brick wall on the highway side did collapse into the street this past weekend. The owner had several offers from folks wanting to buy, but he would never accept any of them! 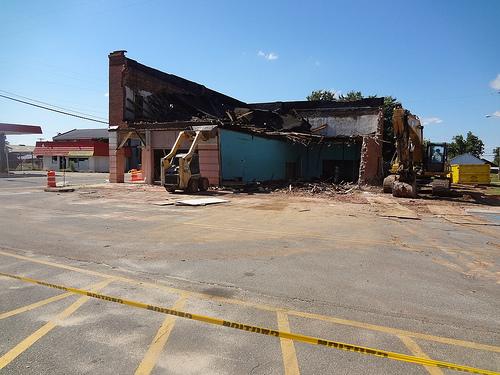 I know that a couple of the ones that wanted the store wanted to restore it and open it up for business again…I was told that the owner paid more to have it torn down than what he purchased it for! I’m so glad that Betty made these photographs to document the loss of such an important place. Please do not share her images without credit.